Thanks (again) to Ramblings of a Technology Coordinator for another great find! Did you know that Google Docs now supports survey-creation with data collection? I apologize if this is old news, but Google has created a very nice, very easy interface for creating and publishing surveys. Basically, you create a blank spreadsheet within Google Docs, click on the Forms tab at the top, and it steps you through creating your survey/form. With six question types to choose from (text, paragraph text, multiple choice, checkboxes, choose from a list, and scale 1-n), you can create a simple yet very functional survey. What I especially like about Google Doc’s survey tool is the ability to embed the survey directly into your html page by using iframes. 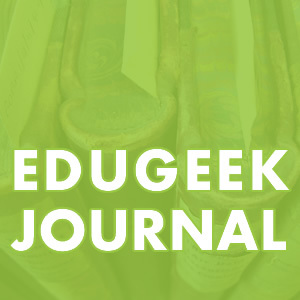 Below, you’ll see the EduGeek Journal survey I created. Please take a sec to answer the questions if you get a chance. Google gave me the code to copy/paste directly into my blog posting. Very nice. You also have the ability to email the survey directly to a list of people, and at any time you can stop accepting survey responses. Wow – something like this could kill Survey Monkey – especially with that embed tool. Can you let other people see the results? Or has anybody actually completed it yet? Our readers tend to be pretty passive – we get hundreds of hits per day between the RSS feed and direct visitors, but hardly any comments :) I really need to get us transferred over to WordPress to make commenting easier…..
As of right now, two people have actually completed the survey. I’m going to leave it up for a few more days, then I’ll start fiddling with the results. But I agree! This could be worrisome for the likes of Survey Monkey.